Fan Arena devises fantasy sports game modes that achieve your goals. Two of the most well-known ways to build your fantasy team. You select players for your team within a pre-defined budget, or salary cap. Each player gets a fictional value, where the top performers are valued the highest. The budget and values are often accompanied by constraints such as a fixed number of players per position and a maximum of players from the same team. Adding a transfer market to your game can make things very interesting during the season. A player can increase in value based on supply and demand. This adds an extra strategy element and rewards your insights. 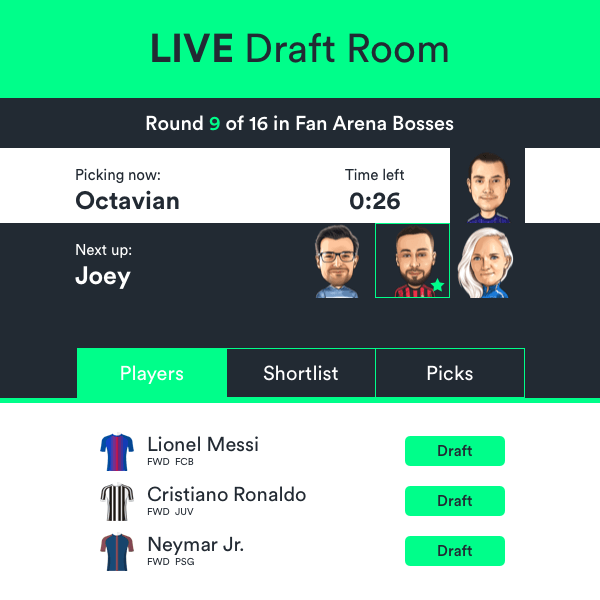 In a fantasy draft game mode the players are allocated during a draft night, a live moment during which teams take turns in selecting players. Each player can only be picked once and doesn’t have a value. The draft process originated in the North America and is used the NFL, NBA, MLB and NHL. The draft night is a very special occasion for everyone involved in a league. A good draft can make or break your fantasy season. The stakes are high! Daily fantasy sports are conducted over short-term periods, often a single day of competition. Predict exact scores or win/lose/draw. Earn rewards or credit. No learning curve. In a career mode a season is divided in multiple periods. You promote or relegate based on your ranking. Another way of allocating players to teams instead of draft or budget. Everyone in a league bids on desired players. Play head-to-head against your opponent’s team and score points when you win or draw. Or use a classic ranking on total points scored. Your fantasy game can run for a season, during the play-offs or for a single tournament. Let's build your custom fantasy game.